This rotary laser kit is the simplest way to get your outdoor job up and running. With simple set-up and visual and audible alarms to alert you when the rotary is beyond its leveling range, you can quickly get the information you need with guaranteed accuracy. And the included remote control and detector allow for one-person operation. 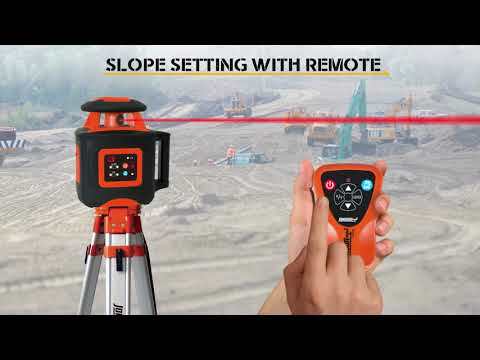 The laser's electronically controlled dual-slope mode takes math out of the equation when checking grade or setting drainage, while its electronic self-leveling in the horizontal plane is ideal for excavation and concrete work. With the included NiMH rechargeable battery pack, 6V battery charger, remote control with 9V battery, detector with 9V battery and clamp, and hard-shell carrying case, this kit comes equipped with everything you need for your next outdoor jobsite! 40-6535 Kit Includes > Laser, NiMH rechargeable battery pack, 6V battery adapter, remote control with 9V battery, detector with 9V battery and clamp, and hard-shell carrying case. 7.4" x 5.9" x 8.15"
The rotary's self-leveling feature in the horizontal mode makes it ideal for excavation, concrete and other outdoor applications, while the electronically controlled dual-slope mode makes this laser ideal for drainage, flatwork or complex landscaping jobs.